*The Economic Dependency Ratio (EDR) is the sum of transfer payment dollars received as benefits in a given area, compared to every $100 of employment income for that same area. Source: CICH graphic created using data adapted from Statistics Canada. Table 111-0016 – Family characteristics, economic dependency profile, by family type and source of income, annual (dollars unless otherwise noted). http://www5.statcan.gc.ca/cansim/a26?lang=eng&id=1110016 -accessed July 21, 2017. In 2014, the economic dependency ratio was 6.4% for children living in couple families and 11% for children living in lone-parent families. 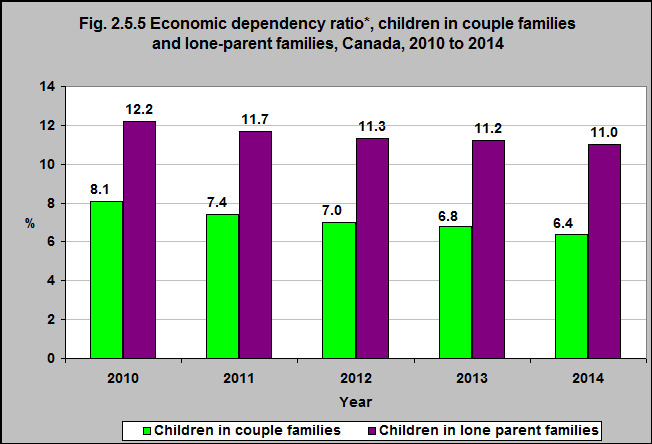 Both were down from 2010 when the economic dependency ratio was 8.1% for children living in couple families and 12.2% for those living in lone-parent families.